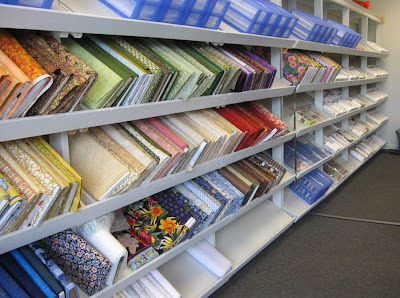 One of the ab-so-lutely fun things about being a Blank Quilting fabric rep is meeting and talking with all the great quilt shop owners ("great" modifies both the owners and the shops). 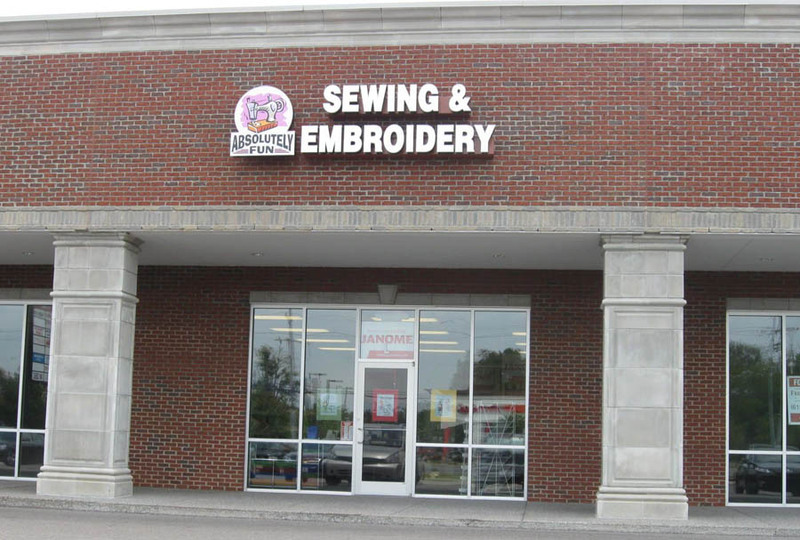 At Absolutely Fun Sewing and Embroidery in Murfreesboro, Tennessee, Judy Winters is the owner of the store, and when you meet her, you'll understand why the shop is appropriately named "Absolutely Fun." It's because she is. Judy's bright and sparkling personality is infectious! She is a Janome sewing machine dealer and her shop carries Janome sewing machines, machine accessories, threads, stabilizers and other products for quilting, embroidery and sewing. She is eager to help and educate customers on their machines and projects, and she enjoys what she's doing. Judy is a relatively new owner of this shop. She has been sewing all her life and got interested in piecing and quilting by machine a few years ago. 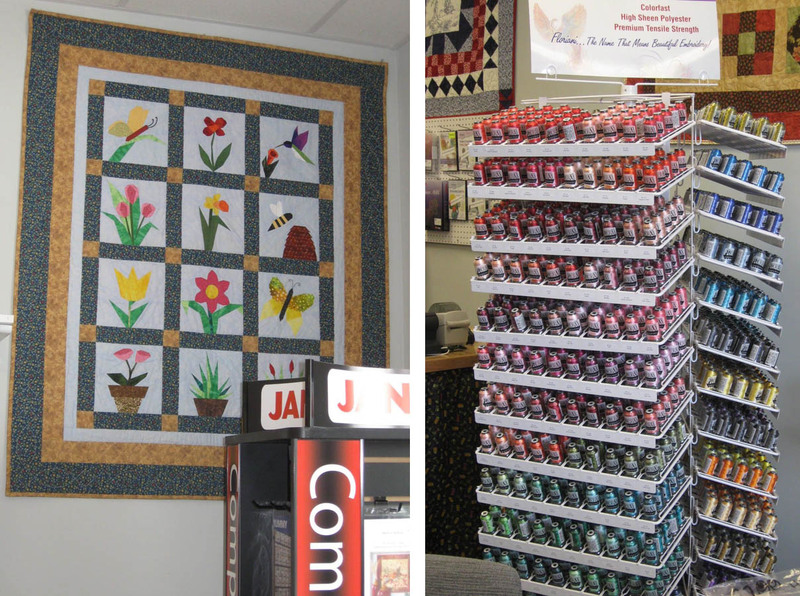 Judy combines embroidery with quilting and shows customers how to get the most out of all those beautiful decorative stitches on their machines. 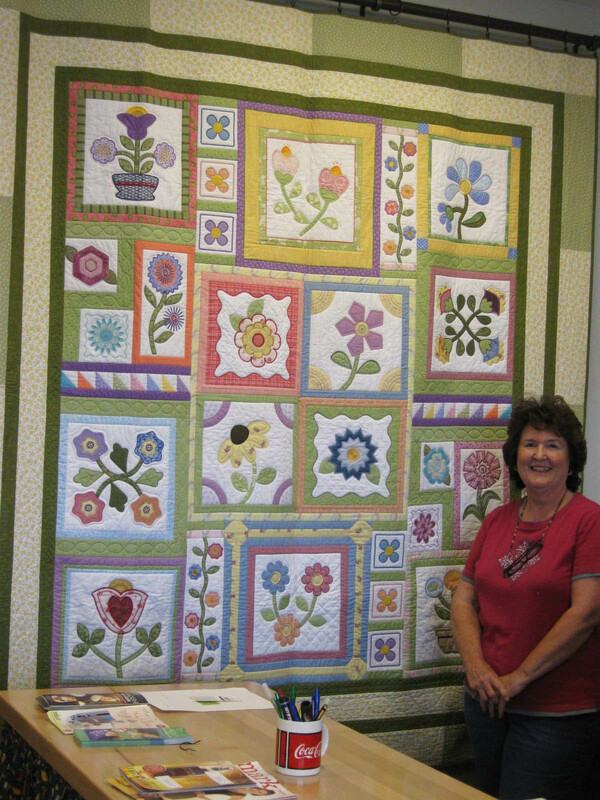 The flower themed BOM (Block of the Month) quilt that Judy is standing beside has appliquéd blocks that are embellished with decorative machine embroidery and stitches. Visit the shop and get a close-up view of this piece. It's gorgeous and your eyes will be opened to the versatility of the decorative stitches on your own machine. Judy is adding to her already great selection of quilting fabrics and has a shipment of Blank Quilting fabrics arriving just in time for her Grand Re-Opening on July 19-20, with more arriving next month. If you have an affinity for metallics, you'll be in good company at Judy's shop. Left: A paper-pieced garden quilt. Right: Floriani thread collection. If you are in the market for a domestic machine to do free-motion quilting, check out the Janome 7700 Horizon. I have done a free-motion test drive on this machine and it's fabulous! And, I overheard her say that she'll have the Janome 7700 at a special price and, with a purchase of the machine, her gift to you is the table, valued at $500. 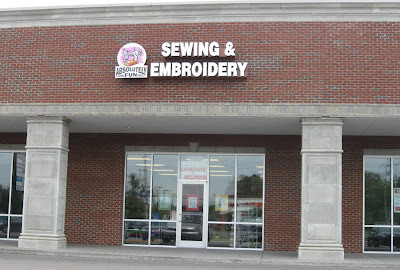 Absolutely Fun Sewing and Embroidery shop, Murfreesboro, TN.